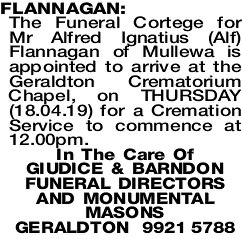 The Funeral Cortege for Mr Alfred Ignatius (Alf) Flannagan of Mullewa is appointed to arrive at the Geraldton Crematorium Chapel, on THURSDAY (18.04.19) for a Cremation Service to commence at 12.00pm. 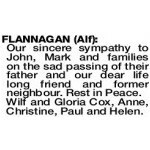 Sincere Sympathy to all the Flannagan family in the sad loss of Alf. A wonderful example to his family. Rest In Peace. 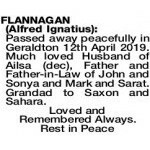 Passed away peacefully in Geraldton 12th April 2019. Much loved Husband of Ailsa (dec), Father and Father-in-Law of John and Sonya and Mark and Sarat. Grandad to Saxon and Sahara. 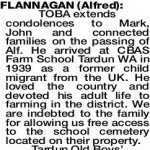 FLANNAGAN ALFRED TOBA extends condolences to Mark, John and connected families on the passing of Alf. 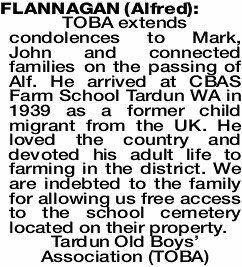 He arrived at CBAS Farm School Tardun WA in 1939 as a former child migrant from the UK. He loved the country and devoted his adult life to farming in the district. We are indebted to the family for allowing us free access to the school cemetery located on their property. 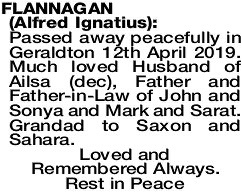 Our sincere sympathy to John, Mark and families on the sad passing of their father and our dear life long friend and former neighbour. Rest in Peace. Wilf and Gloria Cox, Anne, Christine, Paul and Helen.